The wife of an off-duty San Francisco police officer is missing following the mass shooting Sunday night in Las Vegas, police said Monday. 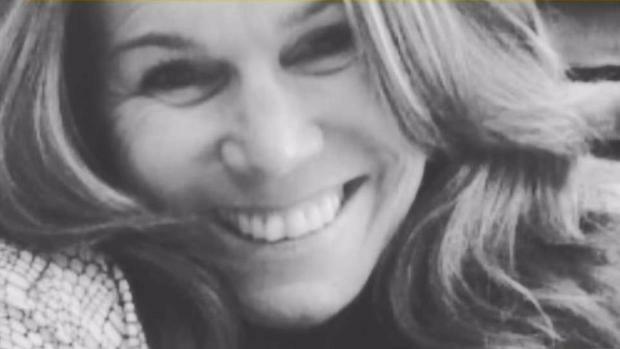 A post on Facebook said that Stacee Etcheber, of Novato, is missing and that she is the wife of Vincent Etcheber, who's listed as an officer with the San Francisco Police Department's Northern Station in a station newsletter from last year. The Facebook post by Al Etcheber, Vincent's brother, also said that after the shooting Vincent helped injured people to the hospital. At least 59 people were killed and more than 520 were injured in the shooting at a country music festival near the Mandalay Bay casino. The wife of an off-duty San Francisco police officer is missing following the mass shooting Sunday night in Las Vegas, police said Monday. Sam Brock reports. Al said his brother shepherded his wife and friends to a partition or scaffolding when the shooting started. Then a woman near them was hit, and Vinnie went to help treat her and helped get her to the hospital in a pickup truck, Al said. Vinnie told Stacee and their friends to "make a run for it" when he thought it was clear. That’s the last time he saw Stacee, Al said. "The complication lied in the fact that his wife did not have her cellphone with her; she had left it at home, probably didn’t want to lose it," Al said. "And then, she did not have her ID on her. My brother held her ID, probably just for safe keeping." Al Etcheber said even more concerning is the fact that Stacee knows her huband's phone number and hadn't called him yet. He also said family members were not being allowed into hospitals or triage centers Monday and had to wait for further instructions. Despite their lack of information, the Etcheber family remained positive. "Stacee’s tough as nails," Al said. "If anyone’s going to make it through this, it’s going to be her. And knowing her, she probably came back looking for her husband or to try and help other gunshot victims." The San Francsico Police Officers' Association said it was sending a crew of its members down to Las Vegas to assist Vinnie in his search for his wife. City officials did not address Etcheber's case specifically but did speak about the tragedy. Mayor Ed Lee said in a statement, "We are sending our deepest condolences and sympathies to the hundreds of families affected by this senseless act of gun violence. Our nation needs stricter, common sense gun laws. We cannot continue to play politics with American lives." San Francisco District Attorney George Gascon also released a statement about the shooting and the country's gun laws. "The rights of gun owners must be weighed against everyone's right to be safe from gun violence," Gascon said. "Lawmakers continue to pay deference to gun owners and the gun lobby at the expense of the public at large." Lee said that as San Francisco visitors, residents and employees prepare to take part in upcoming civic events such as Fleet Week, police will be more present, and they will be working with state and federal authorities to keep residents safe.